Under 10 minutes to kick-off..
2min: Man City 0-0 Dynamo Kiev Some nice build up from City, David Silva involved. Clichy then goes on a rampaging run forward, but his cross goes high, wide and out of play. 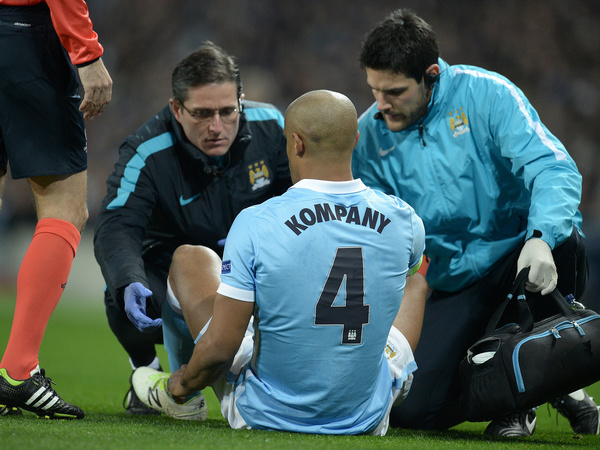 5min: Man City 0-0 Dynamo Kiev: Vincent Kompany has pulled up injured yet again this season. It looks like he has pulled his hamstring while stretching for the ball. Despair etched across his face as he hobbles off the field to be replaced by Eliaquim Mangala. 10 min: Man City 0-0 Dynamo Kiev: Silva looks to play in team-mate Aguero, but his pass is deflected away for a corner. Silva takes the corner but it comes to nothing. All City so far, but how much will losing their captain be on their minds? 14 min: Man City 0-0 Dynamo Kiev: City's next match is hosting rivals Manchester United on Sunday, a game looking very much like not involving Kompany. Big loss. 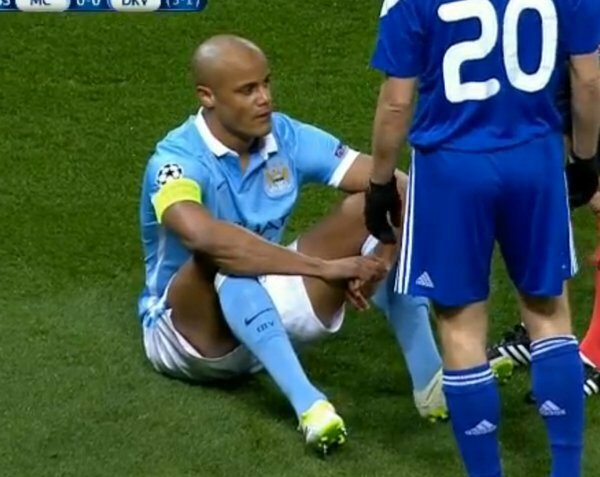 16 min: Man City 0-0 Dynamo Kiev: Another injury. Now Otamendi is down after clashing with an opponent but he's back on the pitch, despite limping. 18 min: Man City 0-0 Dynamo Kiev: Sublime diagonal ball from Toure, he finds Zabaleta who heads the ball across goal, but it is cleared by Kiev. City dominant. 24 min: Man City 0-0 Dynamo Kiev: Otamendi has gone down again. He has not recovered from that earlier clash. That's now both of their centre-backs off injured. Martin Demichelis comes on to replace his fellow Argentine. This is Man City's 46th game of the season and Kompany was making just his 18th appearance. Injuries now costing him and City big time. 30 min: Man City 0-0 Dynamo Kiev: No real chances for either side so far. This is resembling a park kickaround with every passing minute for City. 33 min: Man City 0-0 Dynamo Kiev: The best thing Kiev have done all game - the ball is crossed in the box, Garmash gets a head at goal but Hart punches away. Finally a bit of fight showed by Kiev. 39 min: Man City 0-0 Dynamo Kiev: What a run there by Toure, charging past three players with ease. His pass finds Clichy, but the move breaks down. 46 min: Man City 0-0 Dynamo Kiev: And the teams have kicked off for the second half. Kiev made a substitution at the break - Gonzalez on for Teodorczyk. Lets hope it's an attacking one. 48 min: Man City 0-0 Dynamo Kiev: Another Toure foray forward sees City get a chance. This time from a rather high back pass, which the goalkeeper Shovkovskiy does every well to save with his chest. He probably could of got away with picking it up, but why make life easy for yourself? 57 min: Man City 0-0 Dynamo Kiev: That man Toure again. He fizzes a 30-yard free-kick at goal, but his effort misses the target. 59 min: Man City 0-0 Dynamo Kiev: Incisive ball from Silva finds Aguero, he takes a touch but hits his shot across the goal. Good chance missed there. 77 min: Man City 0-0 Dynamo Kiev: A quality piece of skill there from Aguero. His Cruyff-turn sees him take the ball past not one, but two Kiev defenders. He then lets himself down with an over-weighted pass to Silva. 79 min: Man City 0-0 Dynamo Kiev: Silva will play no more part of the game, he's just been replaced by Sterling. Save him for Sunday, manager Pellegrini will be thinking. Is the new Indiana Jones film just him trying to find where Raheem Sterling has disappeared to? 85 min: Man City 0-0 Dynamo Kiev: All too comfortable for City, but that's a credit to them and Pellegrini's tactics. 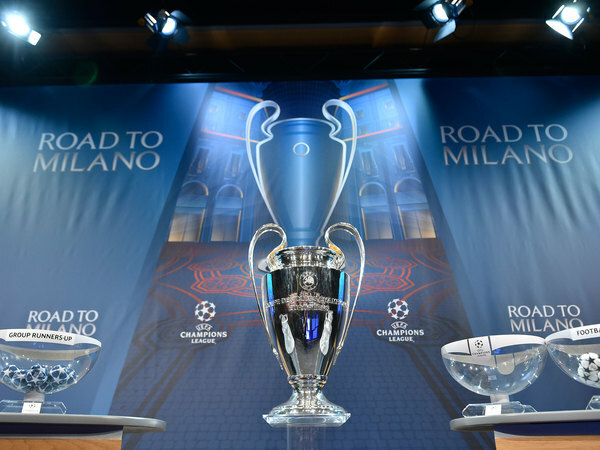 They will be in Friday's draw, when they will be tasked with far stronger opposition. FT: And with the last kick of the game, Hart is forced to make a point-blank save. For the most part an easy night's work for City, but the result has come at a cost - with Kompany and Otamendi forced off injured.